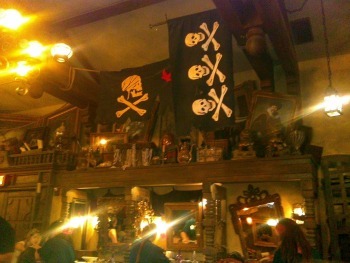 Adventureland in Magic Kingdom at Walt Disney World is the place for all things pirate. Swashbucklers and land lubbers alike head to this area of the park to get their fill of those crazy, pilfering, looting, and plundering sea lovers. A fun way to show off their pirate side is with an appointment at The Pirates League to become a sea dog who’s ready for adventure. 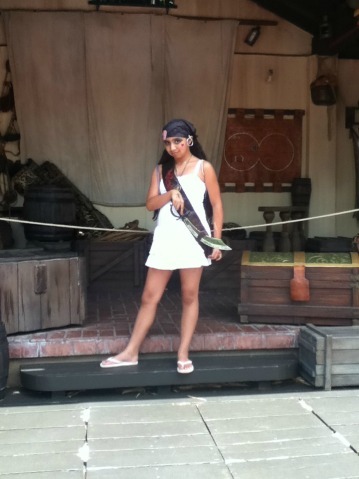 My daughter had the pleasure of visiting The Pirates League at Walt Disney World a couple of years ago and is still raving about the experience- so much that she would love to do it all over again as a teen! 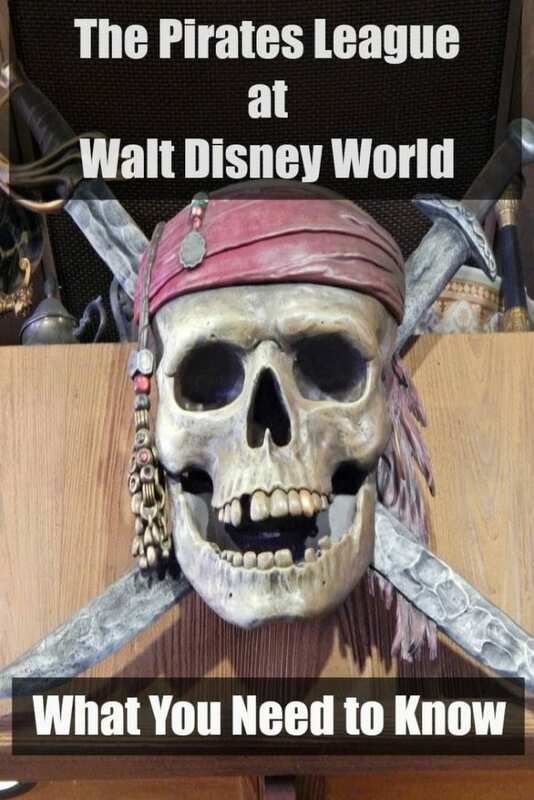 What is The Pirates League at Magic Kingdom? 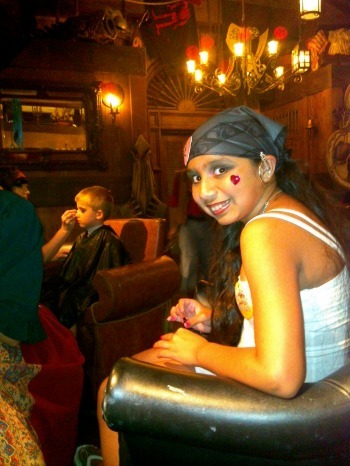 The Pirates League is a cute, Disney-inspired way to transform both kids and adults into either a pirate or mermaid for a day — or until you decide to take off the make-up and fun accessories. 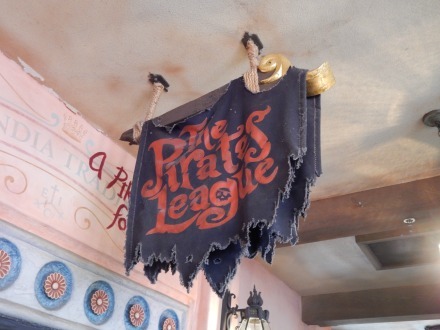 The League’s meeting place in Adventureland is adjacent to Plaza Del Sol Caribe Bazaar and Pirates of the Caribbean ride which is the perfect next stop after your child has been transformed. There’s nothing like going on Pirates of the Caribbean if you’re a pirate yourself, or so my daughter says. After the appointment is over, there’s more fun throughout the day in Adventureland with pirate training and even a mid-afternoon parade through the area for those who participated in The Pirates League. She loved the parade, and although she was one of the oldest kids participating that day, it didn’t bother her a bit. It was also a great opportunity to walk around that area of the park and take some fun photos as Adventureland makes the perfect backdrop. My 9-year-old daughter had a blast getting all mustered up with the Empress Package during her visit. 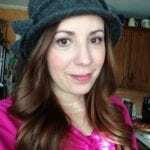 Her first task was changing her name into an official pirate name by rolling numbered dice to choose the first and second parts of her new name. Once her new pirate name was recorded in the captain’s log, we headed into the Muster Station and one of the highly-skilled Pirate Masters was picked to work her magic in the art of pirate transformation. She changed my sweet, innocent little girl into a pirate in around 30 minutes. 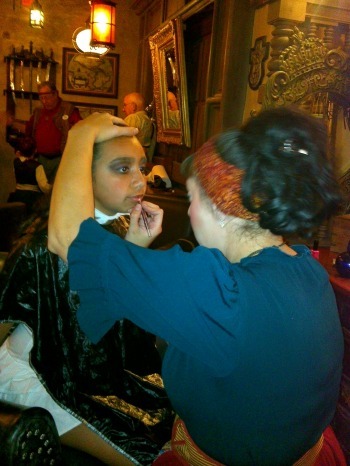 That included make-up application, hair styling, and even nail painting. She was able to watch her step by step transformation in her station’s mirror and I was allowed to take all of the photos I wanted. When her transformation was complete, she took a pirate’s pledge and was announced to the darkly-lit room that a new pirate was just created. She loved the fuss that was made over her and I loved watching her beam from ear to ear. She was given a treat bag filled with tattoos, lip gloss, nail polish, and a couple of other trinkets, as well as a sash and bandanna to wear to complete the look. If you have a child who wants to go all out, clothing purchases can be made in the gift shop next to the entrance and should be brought in to the appointment when you arrive. My daughter chose to wear her street clothes and she looked gorgeous. After her transformation session, we headed into the Secret Room and her photo was taken. If you want the photo for posterity it’s an additional charge, but I felt it was well worth the cost because it’s a memento of her visit. There are other styles of transformation as well to suit younger children or girls who don’t want to be a pirate but still want the experience or want a younger pirate’s style. Jake and the Neverland Pirates, the mermaid package, and the deluxe mermaid package themes give wee ones 3 and older choices. 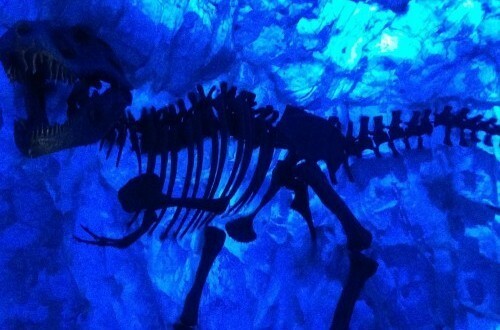 I can definitely understand why a child has to be at least 3 years old. Sitting still in a hairdresser chair for 30 minutes while makeup is applied and hair styled might be difficult for kids younger than 3. The most important bit of knowledge is that you have to have a valid park ticket for appointment day. Secondly, we were asked to arrive 15 minutes early for my daughter’s appointment to allow for time to check in and to get settled. During our visit, the appointments were running a little bit behind schedule, so from check-in to check out it took around an hour. You don’t have to hang around for the outdoor pirate training or Pirate Parade if you and your kids don’t want to. We did because my 9-year-old was really into it, but it’s completely optional. Parents are required to stay with children throughout the entire Pirates League visit so if you have kids who do not have an appointment you may want to consider one adult in your party staying for the appointment while the other takes the kids to another attraction. My daughter had been asking about visiting the League for months before our first visit and I was able to book an appointment for the first day of our visit, happily. 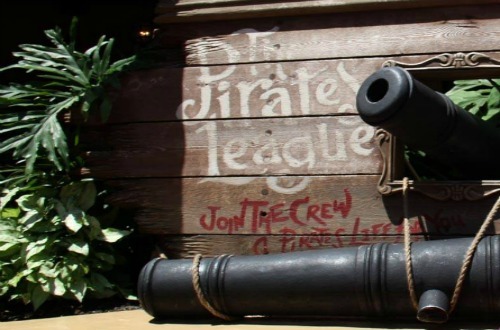 Reservations for The Pirates League can be made up to 180 days before the date you want. I, personally, think that if you know you’ll be planning a visit to Magic Kingdom that far in advance, go ahead and make the reservation because it’s really popular and fills up fast. If more than one family member would like a reservation at the same time, the sooner you call the better for locking in side by side reservations. Should you need to cancel, call at least 24 hours in advance or you’ll be charged a $10 penalty fee. 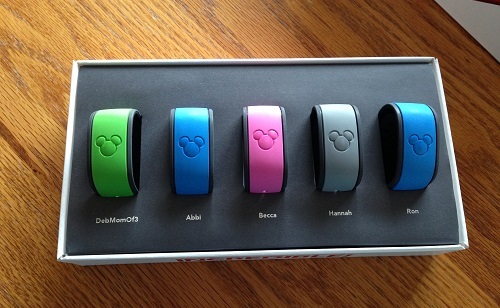 Walt Disney World Multi-Day Ticketing Tips from REAL Moms, REAL Experts!